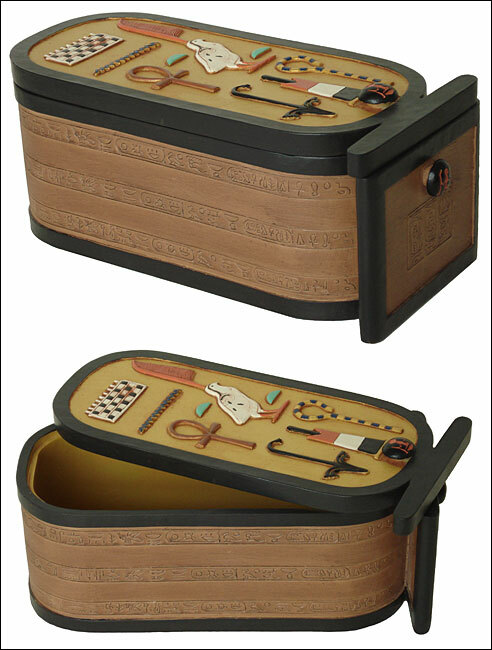 Cartouche box of King Tutankhamun, cartouche box, egyptian boxes, king tut, king tutankhamun. Cartouche is the French word that scholars gave to the oval ring in which a king�s name is written. The ancient Egyptians called it �shenu� which means �to encircle�. The idea being to represent the king as ruler of all that the sun encircled. This box is part of the treasures found in the tomb of the young king Tutankhamun. The lid of the box is inscribed with the name of Tutankhamun and reads as follows: Tut Ankh Amun (Perfect in the life of Amun), ruler of On (Thebes, today�s Luxor) of Upper Egypt.